How Dumb is Darrell Issa? I said ‘dumb,’ not hideous; the latter, we know about. He wants to play the parsing game and say that the pro-womb-control hearing was all about religion and not at all about women’s reproductive health, so, therefore, it was okay to have nothing but men on the panel. House Oversight Committee Chairman Rep. Darrell Issa (R-CA) defended his decision to not allow a women to testifyat his hearing on the Obama administration’s new birth control rule yesterday, telling Fox News host Greta Van Susteren last night that the woman’s story wasn’t at all relevant to the hearing. Democrats had originally planned to have Rev. Barry Lynn, a prominent supporter of the separation of Church and State, testify, but decided that a woman’s voice was needed, as every single other witness was a man. They tried bring in someone who has been personally affected by the issue — Sandra Fluke, a law student at Georgetown, which is affiliated with the Catholic Church and does not insure birth control for students — but Issa refused. He couldn’t have found enough anti-choice women to fill up the entirety of the hearing, or even one of the panels? C’mon…he – and every other anti-constitutionist christianist nutcase in the House leadership – is bound to have Syphyllis Schlaffly on speed dail, as well as Andrea Lafferty, Maggie Gallagher Srivastav, all of the so-called ‘Concerned Women for America’ and whatever female lifeform that Pat Robertson is currently using to prop himelf up with on the (tax-free) 700(million) Club. This entry was posted on Friday, February 17th, 2012 at 11:56 am and is filed under Concerned Women for America, Non-ENDA, Random nutty fundies. You can follow any responses to this entry through the RSS 2.0 feed. You can leave a response, or trackback from your own site. 5 Responses to How Dumb is Darrell Issa? In case that wasn’t a rhetorical question, he is so dumb that his IQ is the square root of minus one. I volunteer for the Democratic candidate running against Darrel Issa this year for the 49th seat in the house. His name is Jerry Tetalman and his website is JerryforCongress2012.com. Check him out. He is a good alternative to Issa who is a rubber stamped Norquist tax pledge signer and the richest man in congress, richer than Romney. I wish Mr, Tetalman well, but lets face it: A pile of moldy, dried-up, thrice-regurgitated oatmeal sitting atop a rusty Edsel hubcap covering one of Jabba the Hutt’s canker sores would be a good alternative to Issa or any of the current Republican House members. Did California’s redistricting make a defeat of Issa anything more than a fantasy? To any who might still frequent ENDABlog Classic: I’m well aware that the above comment is spam. 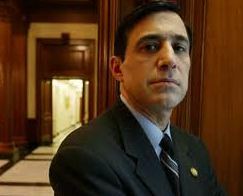 Given that Darrell Issa is, not quite literally but damn close, a canker sore on on the body of the United States’ legislative branch of government, I’m going to go ahead and leave the comment in place. I’d like to think of it as Free Market Karma.